Kale is one of the most SUPER of the superfoods. If you think spinach is good for you, wait until you check out the stats on kale! With about 3 times the calcium, almost 4 times the vitamin A and 9 times the vitamin C per cup compared to spinach, kale is a nutritional powerhouse. We had tons of it in our garden so I started making kale chips regularly. These chips are strangely crispy and addictive, but how can you mind, especially knowing how healthy kale is! I decided to kick my kale chips up a bit with a barbecue version. My kids really like barbecue chips when we visit friends (I don’t buy them mostly because I would probably devour them, and they are a nutritional zero!) I thought they might enjoy this version, so I gave it a try. 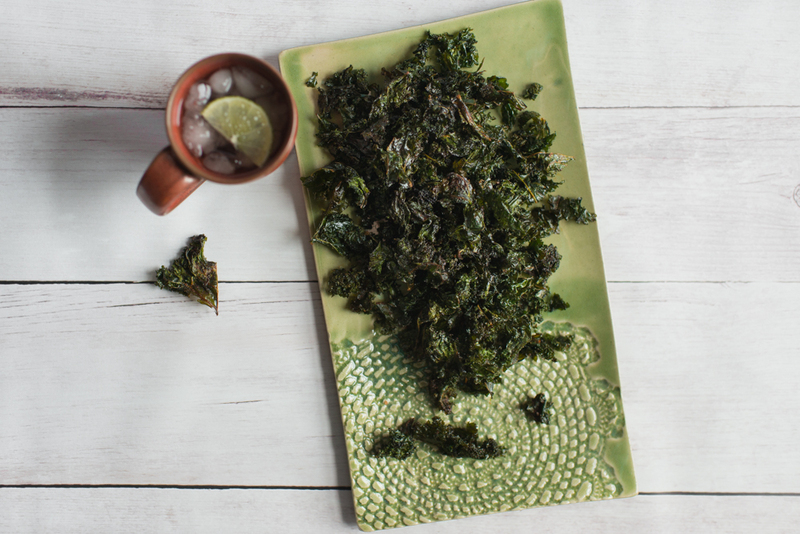 A basic kale chip recipe is seasoned with a BBQ seasoning mix at the end of roasting. If you don’t like barbecue, you can make them plain by just seasoning lightly with salt. Make sure that you watch the chips closely after the first 7 minutes of baking, as they can go from done to burnt pretty quickly. Most varieties of kale will work but I prefer to use Dinosaur (also called "Tuscan") kale, as it cooks more evenly. Preheat oven to 375. Make sure that the kale leaves are throughouly dried. Spray a baking sheet (or two sheets depending on how many leaves you end up with) with cooking spray. Place kale leaves on the pan and drizzle with oil. Using your hands, rub the oil on the leaves to coat the leaves lightly (you may need a bit more oil if some of the leaves are not coated). Bake for about 7 minutes. While kale is baking, stir remaining ingredients in a small bowl until combined. Remove kale from oven, toss leaves around and place back in the oven. Check every 2-3 minutes and remove when leaves are crispy and slightly brown around the edges. Cool for a minute and then sprinkle the seasoning mix over the kale until you reach your desired level of seasoning (depending on how many leaves you have and how much seasoning you like, you may not use the entire mixture). Cool slightly and serve. This recipes would be a great way to get greens into older babies and toddlers (served before seasoning is added or very lightly seasoned). When you bake these greens it takes the bitterness right out. Pick out the crispy little bits for new eaters, and they will melt right in their mouths! Our two year-old Tiny Taster Katherine seemed to love them!